CNN lets go of Marc Lamont Hill after he calls for 'free Palestine from the River to the Sea' at the UN. CNN has reportedly fired a contributor who called for the elimination of the Jewish State of Israel during a speech at the United Nations, Mediaite reported. 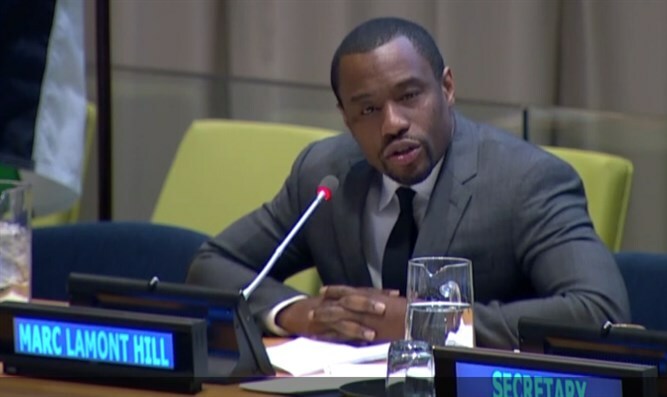 Mark Lamont Hill addressed the opening meeting of the United Nations commemoration of the International Day of Solidarity with the Palestinian People on Wednesday. In his speech, which was first reported by Arutz Sheva, Hill explicitly endorsed the BDS movement and said that "justice requires" a "Free Palestine from the River to the Sea," a phrase that has long been used to call for the destruction of Israel and its replacement by a Palestinian Arab State. CNN confirmed to multiple news outlets on Thursday that Hill had been terminated. “Marc Lamont Hill is no longer under contract with CNN," the company said in an email. Hill's comments drew accusations of anti-Semitism from mainstream Jewish groups in the US. Sharon Nazarian, the Anti-Defamation League’s (ADL) senior vice president for international affairs, condemned Hill’s remarks. “Those calling for ‘from the river to the sea’ are calling for an end to the State of Israel,” Nazarian told the Jewish Journal in an email. “The virulent anti-Semitism spewed by Marc Lamont Hill is abhorrent, and his senseless promotion of violence against Israel is repugnant,” said the National Council of Young Israel. Human rights activist Anne Bayefsky, Director of the Touro Institute on Human Rights and the Holocaust and President of Human Rights Voices, who witnessed the event firsthand, stated: "I have been watching the UN's so-called Day of Solidarity with the Palestinian People for decades and this was an especially obscene UN moment that reveals the true nature of the anti-Israel and anti-Jewish animus of the modern United Nations."